I've been gone for a while, but I was dragged back by the thought of getting heckled by some of you loyal readers, truly a gut wrenching yet striking thought indeed. The Rangers are having their best start in 25 years, but from what I've seen so far, I am not yet fully convinced that this is a how the rest of the season will turn out. I like the play and energy of the team, and I like how the players we received in the off-season are, in the most case, playing up to the hard task of impressing the New York fans. Blair Betts had another strong game he can add to almost every other game he plays in, only this time he actually scored a goal and managed to attain an assist, only the second 2 point game in his career. Ouchh, but not too shabby for a fourth line role player. Another one of my favorite defensive-minded yet aggressively superb players, Freddy Sjostrom, had a nifty wrap around that luckily caught poor goaltender Marty Biron completely out of position; a great move nonetheless. Nik Zherdev=WOW..I cannot express how happy I am that this guy is producing points so early in the season, it is awe inspiring to see him take charge of his career in New York, and I do see a BRIGHT future for him on Broadway. So what does this 4-0 record prove? Almost nothing, except that the team is showing good signs of chemistry and scoring potential, while keeping the defensive zone and goalie area very well covered. On another positive note, the Rangers are in fact getting league wide recognition for their defensive zone trapping system and always have players in opponents passing lanes, a tough system to breach, don't ya think? Well, I do, and that's why I have hope instilled in my heart that this team can keep up their winning ways and continue on this path of seemingly good play. I do know that there is a long, long, long way to go in this season, and yet I can't get the vision of the Rangers playing in the Conference finals out of my head while simultaneously believing that this will all be over by the end of the weekend. 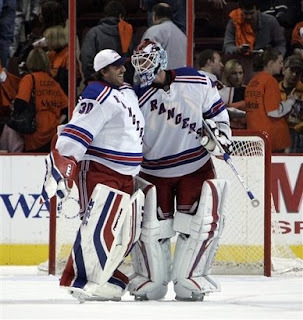 Word- oh yea, isn't that a great pic of our two goalies? It's as if it symbolizes the great relationship between Henrik and Stephan. Nice post syr11 -- I, too, agree that this undefeated run is probably short-lived, but... We are seeing the end of the DARK-Jagr days of the perimeter-play-looking-for-the-pretty-shot. There is some grit there on the ice -- and Zherdev is IMPRESSIVE! I think we're going to see 75-80 points from him. Not bad for Backman, eh? Last night took me back to the Montreal game last season -- giving up after a 4 goal lead -- thank god for Valley-high -- as without him or Hank standing as backup, Philly would have taken the game. Have I ever mentioned how much I like beating the Flyers? Much. We may be seeing the end of the Jagr-days, but we only played one period last night. Just like we've shut down and tried to go into hockey's version of the prevent defence every time we take a lead. Unless this changes the only thing keeping us out of the division cellar will be the Isles. Keep postin' SYR - youre the man.